Beside physicians and pharmacists, the Colonial Medical Corps included some other personnel who were in charge of duties, somewhat less visible but nevertheless of the outmost importance. Nothing could have been done without them. They were the management officers who were in charge of the smooth running of the corps : they were very well qualified people who were able to adapt themselves to frequently unforeseen situations. Their part in the accomplishment of duties which had been assigned to the corps is really an essential one. Then there were also the Corps of Colonial Nurses who were non commissioned officers (NCO). Although they were not as numerous as altogether a native health workers, but they were nearly as numerous as physicians. They brought their expertise in the adaptation of techniques and equipment which had to be used in the human and climatic environment of the tropics. The part which they played was a very important one. They were assigned to important duties such as looking after daily changes in patient numbers, and also managing staff issues, and looking after supplies and equipment. They had to plan budgets and then check they were correctly carried out. Precise but flexible policies had to be set up so that services could keep on running smoothly under different conditions. They were the advisers of medical institutions supervisors and of Public Health Services Directors. They were also liaison officers between their department and the colonial civilian government and the headquarters of the military. As a matter of fact they were in charge of the smooth running of health facilities. In turns they were builders, mechanics, electricians, accountants and sometimes faculty members in local medical academies. Their role was an essential one when their expertise was required by special circumstances. 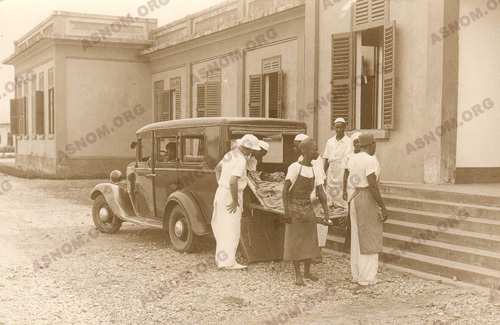 For example ,the 1925 Finance Act provided that medical institutions had to be supervised by local authorities and no longer by the Ministry of Colonies. In every territory the way of transferring this scope of activities had to be negociated by management officers of the Colonial Medical Corps in order to achieve both the enforcement and implementation of this new regulation. Another example of the work they could have to do is found with Gilet*'s action who was Chief Management Officer at the "Hopital Grall" in Saigon at the time of the Japanese hostile takeover in 1945. This officer, while being held hostage, was able to negociate with the Japanese the fate of the Grall Hospital and afterwards this institution remained the only one in town to be left under the command of the French. In 1956 with the implementation of the so called "Loi-Cadre", newly elected representatives became ministers of health or public health supervisors who were in charge of public health services. One had to get used to these new settings and new legislation had to be worked out. Supervision and management of some facilities such as the "Hôpital Principal de Dakar" and the "Hôpital Girard et Robic" in Antananarivo were handed over to France by the countries which were concerned which had now won their independence. These facilities had to be run by the former Colonial Army Medical Corps which was now named "Service de Santé des Troupes de Marine" with a "full financial autonomy". This meant that revenues had to pay for all expenses but budget balancing and profitability had not been so strictly enforced by the time of colonization. Management officers on assignment there had a hard time and great difficulties in fulfilling their duties. In 1954 supervision of the "Hôpital Grall" in Saigon was handed over to the Ministry of Foreign Affairs. During the next two decades until 1975 it kept running in difficult and dangerous situations with the help of a team spirit inspired by medical supervisors and management officers. Well after the time of their independence, these new countries kept on requesting the assistance of these officers for the management of aid funds, for health planning, for setting up a "public health" curriculum in their national administration training schools and also the management of new institutions which had been put in place for the Control of Major Endemic Diseases such as the OCCGE and the OCEAC. It can be said that Management Officers were the backbone of the Colonial Medical Corps. They took their part passing on the legacy of the Corps to these newly independent countries while contributing to the continuation and development of the action. From the very beginning of the Colonial Medical Corps, its non commissioned officers took a large part in the running of medical facilities either in military formations or in colonial civilian medical facilities. A wide range of specialization was available to them such as head nurse, registered nurse, radiology technician, operating theatre head nurse, dental technician, pharmaceutical assistant, laboratory technician, anaesthesiologist assistant whose expertise coming from their assignments to MASH units in the Free French Forces during the second world war, or in Indochina and Korea was invaluable. Other non commissioned officers specialized in the fields of management or of accounting. In every colony there was a squad of nurses under the command of a Management Officer. 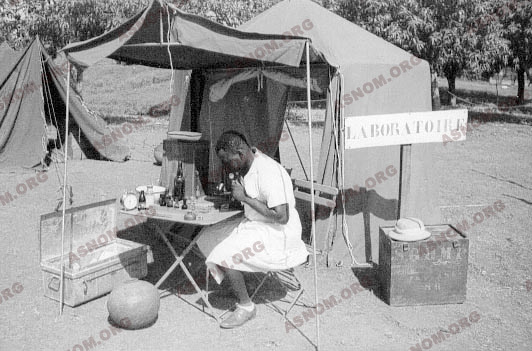 During all military operations, either in the two world wars or colonial wars these nurses backed their medical officers, helping them in an invaluable way. In MASH units they stuck around with their wounded patients, thus becoming prisoners of war. Tributes have always been paid to them and are included in march logs and operation reports. - Comité d’Histoire du Service de Santé : L’Histoire de la Médecine aux Armées. - P. PLUCHON : L’histoire des Médecins et Pharmaciens de la Marine et des Colonies. 1985, Bibliothèque Historique Privat, 14, rue des Arts, 31068 Toulouse.